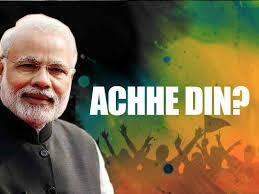 In May 2014, Narendra Modi swept the polls on the campaign of “Achche Din Aa Raha Hai” (Good Time is Arriving)’, and became the Prime Minister of India. In August 2017, his Government completed 40 months (two-third of his term) in power. With just one-third of the term remaining before the Lok Sabha Poll in 2019, PreSense conducted a quick online survey in the middle of September to gain feedback from readers. We received 758 responses from across the nation from different age groups. After removing biased and skewed views, we analysed the remaining 703 qualitatively good responses. Nearly 90 people like industrialists, traders, advocates, chartered accountants, academicians, economists, social workers, and homemakers were also personally contacted, to validate the responses. Although the sample size is small and the respondents were mainly the internet savvy ‘middle class’ society, the results reveal the general trend and mood of the lower middle class and middle-class people (the aam aadmi). The ruling party and the present government could obtain a more balanced feedback, if they conduct a similar survey on a large scale across the country, covering a larger spectrum of respondents. The respondents were asked to indicate one outstanding achievement of the Modi Sarkar. Corruption-free governance, national security, international relations and the concept of demonetisation and GST (Goods and Services Tax) were the top runners. The respondents were asked to indicate one big failure of the Modi Sarkar. Lack of job creation, poor economic growth, price rise, petrol price hike, and execution of demonetisation and implementation of GST were the grave negative points. Interestingly, while the respondents appreciated the concept of demonetisation and GST, they indicated that their implementation caused great inconvenience, both to the common man and to the business community, especially of the Small and Medium Scale segment. The respondents were asked to rate the Modi governance on a scale of 0 to 10. 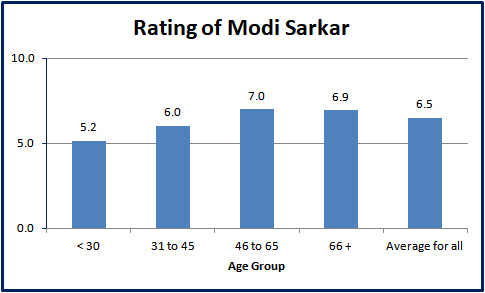 The rating as given by different age groups is shown in the graphics. The average rating by all the respondents is 6.5, and in the ‘less than 30’ age group, it is 5.2. The respondents were asked to indicate the number of seats BJP might bag in the 2019 general elections. The average number by all the respondents is 247. The younger age group indicated 222. 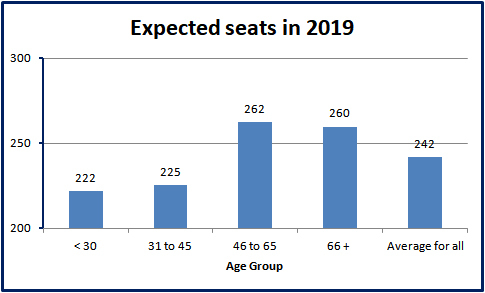 We find that the average for all the age groups is below the magic number of 272. That means the respondents do not expect BJP to obtain an absolute majority in 2019. The same opinion was expressed by almost all the other respondents whom we contacted over the telephone for validation and expert views. Out of 703 respondents, 622 respondents voted for BJP Government in 2014. Of these, only 73% have now indicated that they would vote in favour of BJP again in 2019. The remaining 27% would either not support, or has not decided yet. This is a warning signal for the ruling party. Although there is no anti-incumbency mood against Modi Sarkar, the opinions expressed by the respondents indicate some ‘disappointment’. This is explicit in the younger age group. With this indication, we personally contacted 90 persons from different professional segments across India. Their general view was that demonetisation and GST were very good initiatives, but they felt that their implementation was poorly done, causing disruption and inconvenience to the country’s economic system, and affecting the daily lives of the common people. Demonetisation: A sizeable number of respondents rated this initiative both positively and negatively. That means that while the concept and its objective was appreciated by the people, its implementation caused acute inconvenience to the people. They observed that the Government has not given any official statement about the outcome (success or failure) of the demonetisation move. This initiative was taken to arrest terrorism funding and black money. The average middle-class citizens question the extent to which these objectives were achieved. The silence of the Government and their ‘no comments’ attitude has added scepticism about its effectiveness, among the people. GST: The respondents have generally acknowledged and accepted the importance of GST. However, the confusion over the rates applicable, and the software issues have left the people, especially of the business segment, inconvenienced and disgruntled. Citing the impact of GST, even road-side vendors have now increased the prices, causing discontent among the common people. Hotels charge 18% GST on their food items. Increase in prices of even essential commodities, without corresponding increase in income, has adversely affected the average middle-class family. There is apparently no proper monitoring system at the Government level. “In an urgency to accomplish many things, the Modi Government implemented Demonetisation, and the Bankruptcy Law, revised NPA Rules, arresting black money and GST within a short time and without proper planning, leading to chaos and confusion”, said Prof. K. Prabhakar, Social Economist. 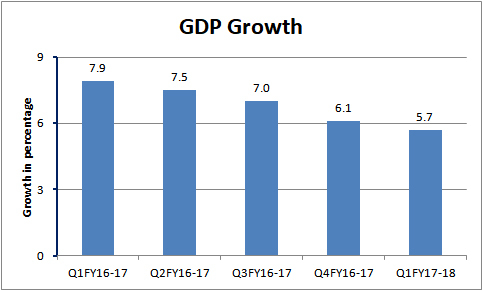 There is a steady decline in GDP (Gross Domestic Product) right from the first quarter of the Financial Year (FY) 2016-17. Out of the present GDP growth of 5.7, the service sector grew at 8.7%, the manufacturing sector at 1.2% and the farming sector at 2.3%. The farming and manufacturing sectors together contribute nearly 80% of the employment generation. 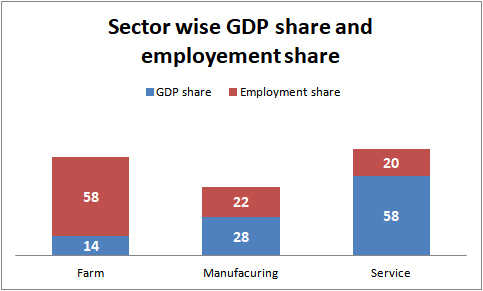 During the previous NDA regime (Vajpayee’s), although the overall GDP growth was lower, the small and medium industries generated large employment opportunities. Dr Subramanian Swamy, well-known economist and Member of Parliament representing BJP, warned in August 2015 itself that the economy was in a ‘tailspin’, threatening an economic crisis. He suggested the formation of a crisis management group consisting of experts, to correct the situation. Unfortunately, his warning was ignored. The economic slowdown, which started in Jan 2016, continues till date. The Government took the risk of implementing demonetisation and GST in this economic situation, adding more stress to the system. The UK-based daily, The Financial Times wrote, “Modi is, by his own admission, an economic novice. But he has disbanded his Economic Advisory Council and launched demonetisation on his own whimsical initiative. His predecessor, Manmohan Singh, was an economist and yet relied on the group for advice. There is a lesson there for Mr Modi”. Now, after realising the ground reality, the Government has revived the Economic Advisory Council. During the course of our personal talk, many BJP and RSS leaders have expressed their concern, in anonymity. The party leaders feel that they have been distanced from the Prime Minister and the Party President. They perceive that the Government is run more by bureaucrats than by the ministers. P K Khurana, Consultant from Chandigarh, said that nearly 40% of the SMEs are suffering due to demonetisation followed by GST. Prasanna Venkatesan, a leading chartered accountant criticises the Government for introducing GST without any preparation, leading to chaos. “Under the new system, exporters have to pay the ‘drawback’ in advance, and claim separately. This has affected exports badly”, he added. There is a general perception among many respondents and experts with whom we spoke that this Government overloads the public with periodic slogans as Achhe Din, Skill India, Make in India, Start Up India, Stand Up India, Swachh Bharat and the like. Unless these slogans are translated into performance, they tend to disillusion. People have not felt their impact in their respective fields. One is not informed of the present status of all these projects. For example, banks have not taken the Mudra Loans and Stand Up India loans announced by the Prime Minister seriously, to generate entrepreneurs. The Vidyalakshmi Portal launched by the Finance Minister with a big bang in August 2015, to provide education loans to students, is still a non-starter. The schemes to develop agriculture are yet to be implemented effectively. At the time of demonetisation, the Government had promised that the banks would use the funds to facilitate more entrepreneurs. It has not happened yet. Although our quick survey was confined to online questionnaires targeting the middle-class society, it has definitely indicated the mood of a critical segment of the society, projecting the perception of the respondents. Modi rode to power based on his promises, and especially due to an anti-incumbency verdict against the scam-tainted Congress-led UPA (United Progressive Alliance) Government. Most of the people still perceive the Modi Sarkar as a ‘clean’ government without any major scams. However, they feel the implementation process is very weak and ineffective. People do feel annoyed when the government leaders focus only on slogans and chest-thumping even at the time of a crisis. It is acknowledged that some of the government ministries like highways and electricity are doing good work. Unfortunately, these are not projected to the people because of poor media management by the Government, Thanks to the sensationally upbeat news and social media, the negative aspects of the government’s performance are broadcasted. We observe that a large gap exists between the leadership and the cadre. Even the recent cabinet reshuffle has caused some dissatisfaction among the cadre. There is a perception that more importance is given to bureaucrats and the Rajya Sabha Members, who do not have direct connectivity with people. For example, Arun Jaitley has been entrusted with four major Ministries in spite of his health issues, that could affect his competence. The Finance Ministry itself, which is with Jaitley, needs a full-time Cabinet Minister. The Government appointed full-time Governors for several major states like Tamil Nadu, Bihar, Madhya Pradesh and some of the North-Eastern states, just recently, after many months. The people are getting concerned about the state of affairs in the country under the Modi Sarkar. There is no anti-incumbency against the Modi Sarkar. However, if corrective steps are not taken on time, the disappointment could slip into an ‘anti-incumbency’ mood. This survey is to be taken only as a ‘warning bell’. The Modi Sarkar should not ignore this warning, in spite of a divided leaderless opposition. “The economy in the world over, is in stress. Fortunately, India and China are showing positive growth. What we face is only ‘deceleration’ and not ‘de-growth’. The Government should understand the ground reality and step up corrective measures immediately, to avoid further deceleration. The Government should also focus on perception management. The economy alone will decide the politics”, said K T Jagannathan, Associate Editor of The Hindu and senior economic journalist.